Greetings friends and fellow crafters, LeeAnn here with my second project for November with Kennedy Grace. 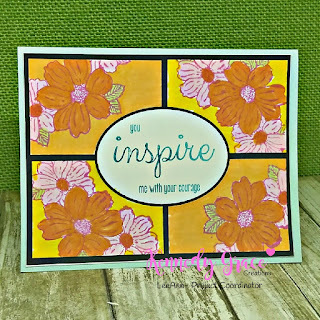 I was having a little fun on my computer with my Silhouette software and designed this frame design, and used two of our stamp sets (Kindness Medley and Inspire) to complete my project. First I printed this frame design on 110 lb cardstock with my Ink Jet printer. 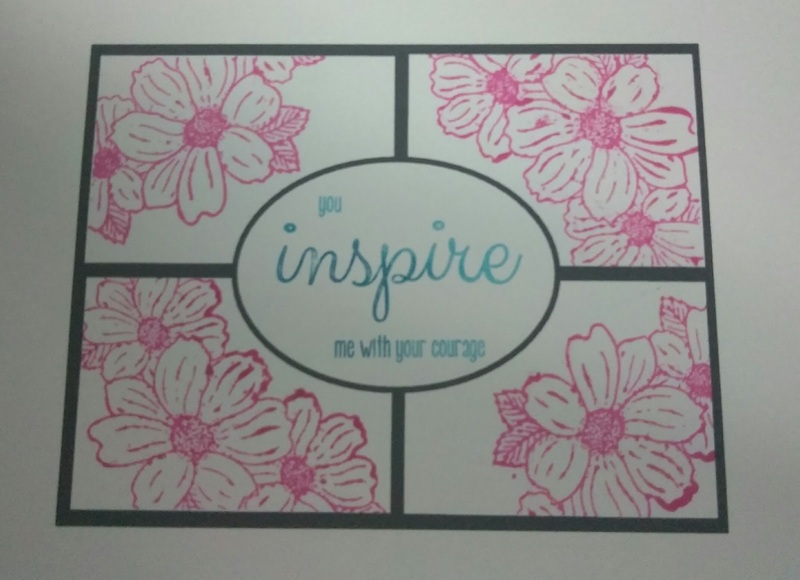 Next I used my Stamp Press and stamped the flowers from Kindness Medley in each of the corners, while also masking off the opposite boxes so that the flowers did not run into each other. I used Memento Love Letter to stamp the flowers. 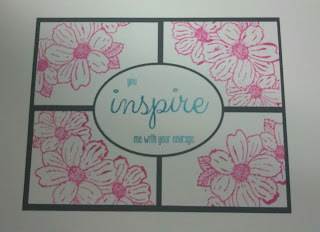 My next step was to stamp the sentiment in the middle oval from the Inspire stamp set. I used Memento Bahama Blue to stamp the sentiment, varying the strength of touch to leave an ombre' look. 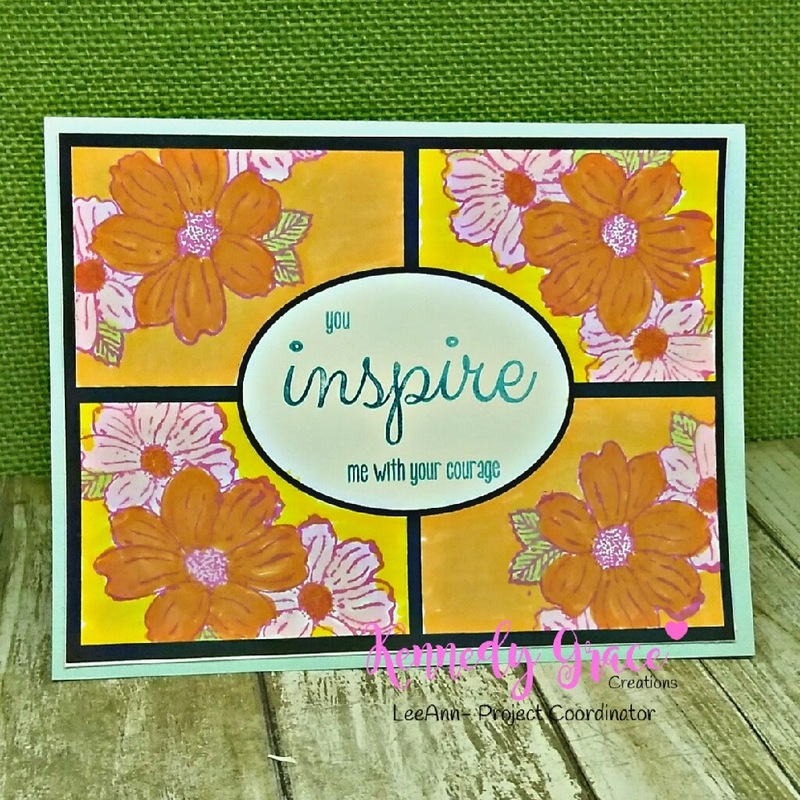 From here after all ink was try I went into coloring mode using my Memento markers to color the flowers using Angel Pink, Dandelion, Tangelo, Cantaloupe and New Sprout. My final step was to cut the panel down to 4" x 5.25" and adhering it to an A2 base using Tear it! Tape. I wanted to use some sequins on this, however the card is being sent to my daughter who is at Coast Guard Boot Camp and sequins and glitter are a big no no.